Design is a fantastic thing. People take the ordinary and transform it into cool or useful designs that benefit people on the day-to-day basis. What is more day-to-day than a cup of tea or coffee? The British Empire was built on a cup of tea and it could be argued that many estate agents cannot get out of bed without a cup of tea! Therefore the team at Resource Techniques has compiled the top X of coffee and tea mug designs. 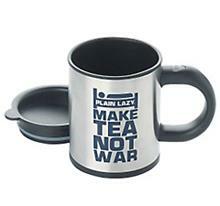 Perfect if you are stuck on what to get the boss or just love a 'cuppa' this Christmas. Do you love your latte with lots of froth but find that it always leaves an embarrassing milky moustache? The Moustache Mug will leave you humiliated and 'tache free. It's simple design whilst being very effective against the constant battle against facial fuzz. Just shame about the dodgy looking website. Does someone in your estate agency continuously get your tea or coffee order wrong? 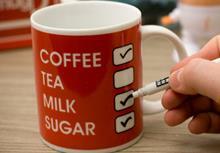 This tick box mug will limit the chance of someone ever getting your order wrong ever again. Experienced and stressed agents will put double digits in the sugar tick box. Again another simple design whilst the vendor is the UK which is always a plus this close to Christmas. You can now be the office comedian by giving your boss or colleagues this funny animal face. The Animal face mug is designed in a way that it looks completely white and the drinker quickly transforms into 5 different animals. Hilariously childish! Do you fancy yourself as a rocking estate agent or just someone that loves music? 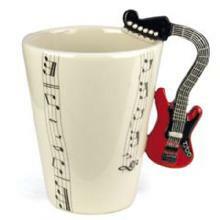 The Electric Guitar Mug is the perfect for you. The website link suggests that the design is both fun and practical! Apparently designed by two French designers, the Ceramic self stirring tea glass will save estate agents money time and money on plastic/metal spoons. This is a really innovative design. 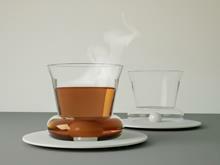 By rotating the glass, the ceramic ball at the bottom naturally stirs the tea without any hassle. Welcome to the future of design! The self stirring mug isn't as innovative as the previous tea glass but is perfect for the lazy estate agent. Just a quick press of the stir button and the tea is instantly stirred using a small motor. Batteries are included, the website does not state if they are replaceable. Every parent knows that there is danger everywhere after having children. Designed for security, The mummy mug is perfect to ensure that children do not get hurt from their absent minded mummy or daddy. The website states that the mummy mug will be going worldwide in the spring of next year. Unfortunately agents, this is not one for Christmas. 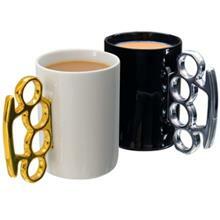 Any estate agents from the east-end of London can show property searchers just how hard they are with the knuckle duster mug. 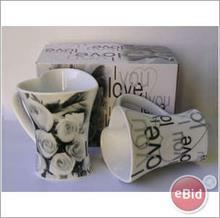 Another benefit of this design means that grip on the mug is certainly secure! Bad news coffee fans. This design does not seem to be to be available in shops but it is a very, very cool design. Not only does it look aesthetically pleasing to the coffee addict but will also make your hands smell like rich coffee. Washing not advised. Estate agents, will you be investing in any of these designs? Contact us via our website, Twitter or Facebook page!